Editor's Note: This post was originally published in April 2015 and has been revamped and updated for accuracy. Who isn’t insanely busy these days? If you are like so many other health conscious gym goers, it can be hard to find time for all the prep that goes into eating clean at home. There just aren’t enough hours in the day sometimes. Roseville’s best bet for fast Indian inspired vegan eats, the Baagan’s motto is, “Eat the way nature intended.” For Baagan patrons, that means healthy menu offerings that include items made with fresh, local ingredients whenever possible. All the food Baagan makes is free of artificial colors and flavors, and everything on the menu is gluten free, minus the multi-grain bread and spinach herb tortilla. Prices are very reasonable and favorites include the peanut butter cup smoothie, the curry panini, and the mushroom spinach quesadilla. Magpie Cafe is another healthy restaurant here in Sac that offers delicious meals made with fresh ingredients that are locally sourced. This is American food that comes from a place you can be proud of. Magpie does lunch and dinner during the week, with a brunch option on Saturday and Sunday. Lunch has items such as the winter BLT, natural pulled pork sandwiches, and beet with egg salad. Dinner looks just as mouth watering. If you’re wanting to sink your teeth into some serious taste, try the crispy pork belly with kumquats or the manila clams with saffron. Don’t get married to any of these delectable dishes though. The menu changes seasonally, if not weekly or daily. But it’s a safe bet you’ll love whatever they’re serving and will leave with a full, happy belly. This Vietnamese beacon to Sacramento’s vegetarian and vegan communities aims delight the body as well as the mind. Andy Nguyen’s sets itself apart from other restaurants by enhancing the dining experience with complimentary offerings of loose leaf tea and fresh juices and upholding a strict tradition of respect for the community and nature. Their dishes are not only delicious, they are creatively named with love, and entice you right from the menu page. Dishes like nirvana lemon salad and peaceful curry are hard to ignore, Why would you want to when flavors and freshness are so, so right? Definitely one of the most affordable places in Sac to find traditional Japanese ramen, Shoki Ramen House uses grass fed beef and organic veggies in their dishes. 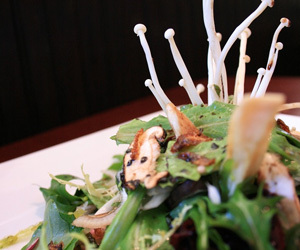 Owner, Yasushi, puts a lot of healthy thought into his menu selections, and carefully combines fresh healthy ingredients with complex flavors to create dishes that are nutritious and delicious. You can even find gluten free options at Shoki. Get your tan tan men with an egg for some extra protein, and get there early, ‘cause everyone who knows how good this ramen is will also be there for their noodle fix. The theme at Boulevard Bistro in old town Elk Grove is local, local, local. They focus on the regional ingredients that they can find organic, sustainably raised, and as fresh as possible. Boulevard Bistro also has a terrific wine list comprised of over 50 selections pulled from the best of what the Napa/Sonoma area has to offer. Brunch, lunch, and dinner menus leave very little time in the day when you can’t slip over and get a tasty meal that won’t hurt your health. Try the del rio farm mix spring salad with roasted butternut squash and the grilled swordfish with garlic wine sauce if you want a meal that will dazzle your senses without compromising your healthy diet.